Fueltone® Pro professional engine treatments are customised to optimise engine performance. 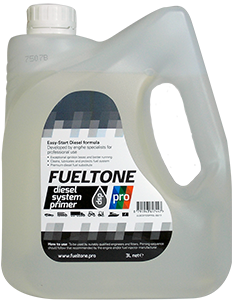 Fueltone® PRO Diesel System Primer is designed as a premium fuel replacement filter primer; advances and protects fuel pump and all exposed metal components; reduces stress on the system during priming; cost effective multi dose bottle; no mixing required. 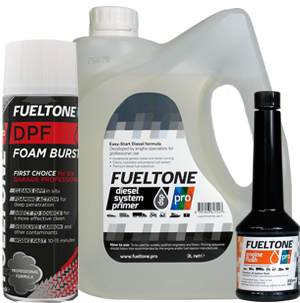 Fueltone® PRO Specialist Engine Flush is a specialist product designed to enhance the flushing of contaminants such as particles, thickened oil and trace moisture; designed to be added directly to the old engine oil; de-waters, lubricates, cleans and protects engine components; single dose easy to use bottle; fast - works in 2-5 mins. Scientifically designed for priming diesel engines with exceptionally good ignition properties and additives designed to reduce stress on exposed metals.